Are you in transition and wanting to de-stress, recharge, and re-discover your inner self? Do you feel a calling to re-discover who you really are, and what you want most in life? It’s time to re-examine your life, create better balance, get away from the grind, and grow your whole self – body, heart, mind, and spirit! More and more people today are tapping into the transformative power of retreats. These retreats are customized for you, and are offered as individual programs (not group). For self-care and to navigate career and life transitions – Personalized individual retreats offer you a perfect get-away to immerse yourself in the healing power of nature and horses. The program helps you reflect, create a better sense of self, and ease the transition to the next stage in your life. To find purpose and spiritual renewal – “When you change the way you look at things, the things you look at change” – Wayne Dyer. Through Horse guided learning you can re-align yourself to your emotional and spiritual self, gain new perspectives into your world and yourself. These are the key steps towards transformation and personal growth, and reconnecting with your life’s purpose! For personal healing and to create new unlimited possibilities for your life – Difficult personal experiences such as illness and other family circumstances require you to step back and process everything – especially when you are balancing your personal and professional worlds. 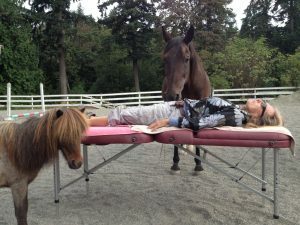 Horse guided retreats offer a unique way to heal while bringing more clarity and peace in your life. Contact me today and reclaim all that you are. Choose from our personal one-on-one retreats, spiritual healing retreats and renew yourself from the inside out! Learn how to eliminate the limitations that create pain and struggle using The Work™ by Byron Katie and live more freely! Experience the world from a new perspective. 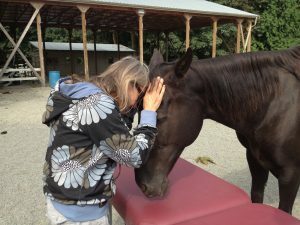 Linda-Ann and our herd of amazing horses have created a beautiful retreat center – a sacred space for your learning and self-development in the midst of nature. Discover the magic of horse guided learning, create a bond with one of the herd, and discover new insights into yourself through your horse partner.